“Dearly beloved father; it would be easier for me to express my feelings in musical phrases…” —Seven-year-old Chopin in a letter to his father. The name of Frederic Chopin (1810-1849) needs no introduction. The poet of the piano, he was immortalised by historians, music critics and poets. The Polish composer and piano virtuoso lives most impressively in his music, however, played by renowned pianists the world over, with competitions in his name exploring many different interpretations of his creative soul. The International Chopin Piano Competition, held since 1927 every five years in Warsaw, is among the most prestigious monographic competitions in the world. In parallel, many other Chopin piano competitions are taking place in many countries targeting local or regional musicians of all generations. Egypt has its own share of the celebration of the composer through an annual event tailored to the youngest piano talents: the Chopin Piano Competition Egypt (CPCE). Organised by the Egyptian Youth Music Association (founded in 1985), in collaboration with the Polish Embassy and the Cairo Opera House, this year the competition was in its fourth round. For two days at the Cairo Conservatory, on 24 and 25 November, the jury listened to the young contestants while on Thursday 27 November a special concert at the Cairo Opera House brought the winners together with other pianists. Though CPCE stresses Chopin, it includes works by other composers. The competition was initiated by Fawzy El-Shamy, former dean of the Cairo Conservatory, who contributed numerous musical initiatives to the Egypt’s music scene, focusing on education and youth activities. In 2006 he founded the Arab Youth Philharmonic Orchestra, with musicians from over 11 countries, of which he remains artistic director. The orchestra gave its first concert in Syria and went on to perform in Germany on several occasions. “The idea of CPCE was on my mind since 2009. I could see so many piano students we have at the conservatory who, unlike violinists for instance, have few opportunities to perform outside school. The CPCE is one way to let them showcase their talents,” El-Shamy explains. Throughout the four editions, the CPCE jury has included world famous names: Ramzi Yassa, Egypt’s internationally acclaimed pianist; Tarek Sharara, composer and music critic; Hani El Shabrawishi, head of the piano department at the Cairo Conservatory; Mariola Cieniawa-Puchala, famous Polish pianist and professor at the Cracow Academy of Music, who alongside El-Shamy, pianist Moushira Eissa and piano professor Amal El-Shahed was a jury member this year . “It is the third time I have taken part in the jury of this event,” Cieniawa-Puchala reveals, elaborating on her impressions of the competition, its development and importance in the world of music. The Polish pianist is no stranger to the Egyptian audience; she gave a memorable recital at Cairo’s Manasterly Palace in May 2013. Born in Gorlice, a city in south-east Poland, her resume includes a number of prestigious awards, including second prize at the International Frederic Chopin Piano Competition in Palma Majorca (Spain, 1990), third prize at the Chopin Piano Competition in Cologne (Germany, 1991) and two Frederic Chopin Artistic scholarships (1983, 1984) in the competition organised by Chopin Association in Warsaw. Since 2002, she has been the director of the Summer Music Festival held in Krynice, south-east Poland. This year the event was divided into four age groups: up to 11 years old, 12-15, 16-18 and over 18. “This division makes clear classification between children, but I believe that three age groups should be enough. The biggest development of a child pianist begins at 13-14 years old. The second edition of the same competition had three age categories which I found much better as a classification,” Cieniawa-Puchala explains. She also points out the challenges that too many categories can create, particularly when a competition has only 11 contestants (out of over 20 preliminary submissions), with none in 16-18 age group this year. As the competition is continuously developing, El-Shamy also thinks about the most suitable age division, insisting that the best equation will be reached in upcoming editions of CPCE. He adds that having the competition’s regional reach in mind, the programme of the 2015 competition will be announced within coming weeks. Both El-Shamy and Cieniawa-Puchala agree that CPCE 2014 saw many talented contestants, whose level was much higher than any shown in 2013, when no one won first prize. The regional scale will also answer Cieniawa-Puchala’s concern regarding the low number of contestants this year. While over 20 young pianists expressed their readiness to participate, only 11 took part in the competition, which El-Shamy says is due to the competition coinciding with examinations at many regular schools. On 25 November, three first prize winners of the fourth Chopin Piano Competition Egypt were announced: Lara Osama (up to 11 years, student of Marcelle Matta), Mahmoud Gado, 14 (12-15) and Abdel-Rahman Bahieldin, 19 (18 and above), both students of Elena Dzamashvili. The youngest received two more prizes: second for Alexandra Selim and third for Yehya Mohamed El-Harmil. 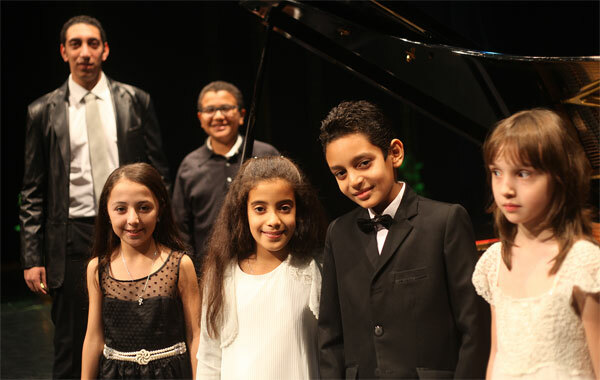 Appreciation certificates were handed out to other participants as the results were announced at the Cairo Conservatory, and the winners and number of the youngest pianists gave a special concert at the Cairo Opera House on Thursday 27 November. Music is a very enriching tool. Not only does it carry many educational and aesthetic values, it also gives children and young people a channel through which to convey their emotions. Naturally, the interpretations of Chopin’s work by a ten-year-old and a mature musician with the baggage of a whole life’s experiences will differ. Cieniawa-Puchala says that what makes a musician interesting is their ability to communicate their own understanding of the work, regardless of how old they are. “Naturally, younger pianists will always have less experience but this does not reduce the fact that they always have their own unique emotions, ingrained in their own young lives. They succeed when they manage to transfer those emotions to the audience. This was the case with the competition winners,” the Polish jury member concluded. The first prize winners will travel to Poland where they will participate in a masterclass under Cieniawa-Puchala.